"Sa Lolla Fiorida" is located in the gracious turistic area of Pula, only 30 minutes from Cagliari, the main town of Sardinia. Is splendid geographic position guarantees unforgettable emotion. A much sought-after destination for turist coming from all over the world, it offers beaches of incoparable beauty, unexplored mountains and the streets of the ancient fenician-punic-roman city of Nora; one of the most important archeoloic heritages of the island. Pula offers an infinite variety of services and the pleasure of spending ones days through different activities and hobbies both recreational and cultural, in fact, the continuos evening dedicated to traditional folkloristic events, tasting of typical gastronomic products, concerts in the squares, theatrical shows, exhibitions and museum combine perfectly with the various excursion on the territory, sports such as tennis, golf, windsurfing, scuba diving and horseback riding. The long night can then be concluded by discovering the night life present along the coast. 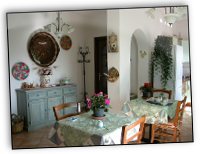 "Sa Lolla Fiorida" is a comfortable and cozy bed and breakfast which also offers apartment. 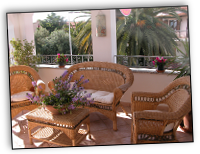 It is situated in a large typically Mediterranean garden. It is furnished with taste down to the smallest details and contains comfortable, bright bedrooms, ample-flowered verandas and a gracious relax room ideal for pleasant moments with a book, a documentary on tv or a parlor game. Everything naturally is equipped with air conditioning. Breakfast is continental and can be enjoyed either in the lounge or on the sunny terrace. The garden also offers convenient private parking.